Today I bring you a rice krispie treat that in my family has become something of a tradition for long road trips. While these treats are good on their own, when they've been sitting in the back of the car getting heated up by the sun as you drive, they turn into ooey gooey deliciousness. Not that they aren't gooey to begin with, because, my friends, they are indeed. In a good way, of course. I decided to make these for a 4th of July get together this year rather than doing something complicated, because yes, these are incredibly easy to make. You don't even need to bake them at all, so the "oven" moniker there at the top is a bit of a lie. But whatever! Now, when I made this particular batch, they were too gooey. I think we normally put in more rice krispies than the recipe said to. 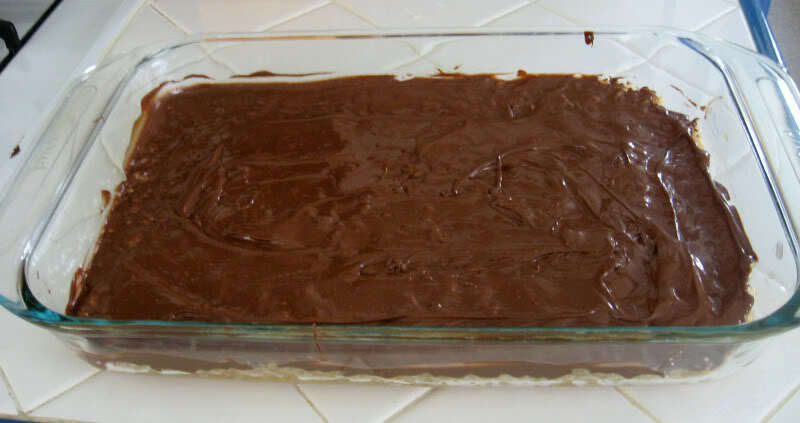 It also seemed like the rice krispie layer was too thin as compared to the chocolate, so I'm putting the amount I think you should really add in below. But you can futz around with it as you see fit. You can even put in some mini marshmallows after you've melted the sugar and syrup together to give a little pizazz. 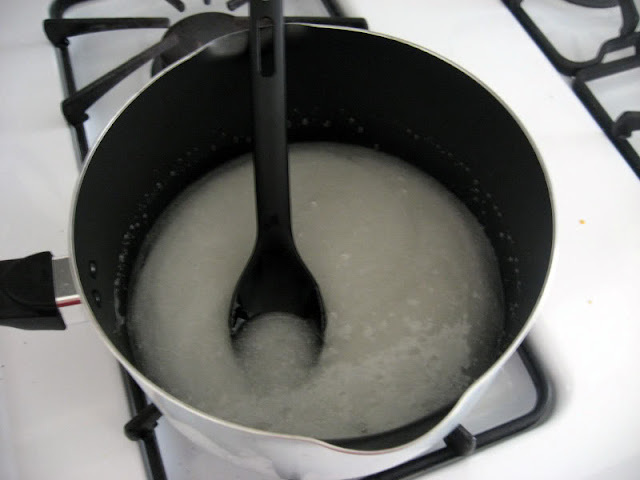 Boil the karo syrup and the sugar for about one minute. Remove from heat and add in the peanut butter, mixing in until smooth. 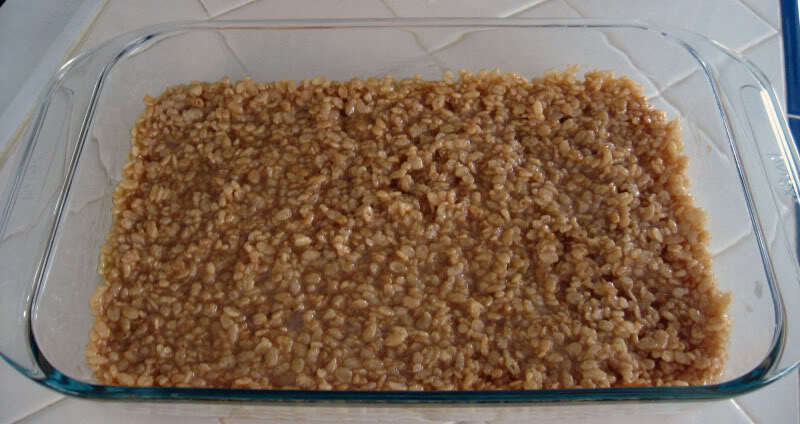 Fold in the rice krispies until they are completely covered, then press into a 9x13 pan. 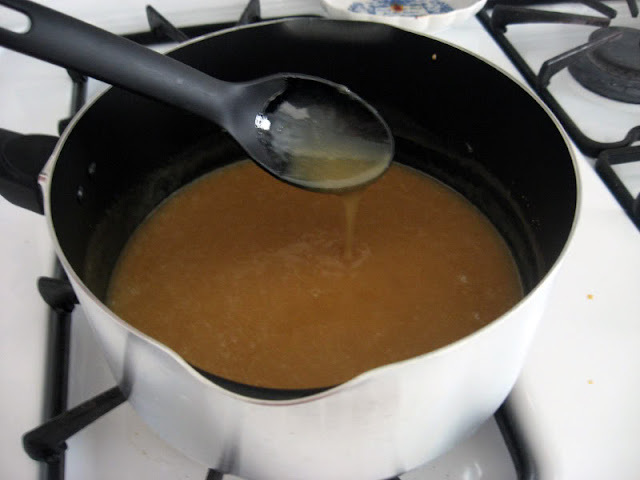 In a microwave safe bowl, melt the butterscotch and semi-sweet chips. Start at one minute, stir, then go at 30 second increments, stirring in between, until they are smooth. Pour it on top of the rice krispie base and smooth out to the edges. Let sit for a while until the top has hardened. Bada bing, you're done! The syrup and sugar getting friendly. After adding in the peanut butter, it turns a caramel color. After adding in the rice krispies and flattened in the 9x13" pan. Now, with chocolate. Resist digging in and let it sit. Uncovered will be faster. Ooey gooey. Normally the bar would look more uniform, but as I said I should've added more rice krispies. In any case, still tasty! I would also recommend using quality chocolate chips. These were just the store brand, so the chocolate-butterscotch top doesn't taste quite as good as I remember. Let's be honest, the whole thing wasn't as good as I remember, but it's the first time I've made them in like... oh... six years? So there is room for myself to improve. I'm going to try freezing some to see if they aren't so gooey (they are to the point right now where they don't even keep their shape, so it's been difficult). 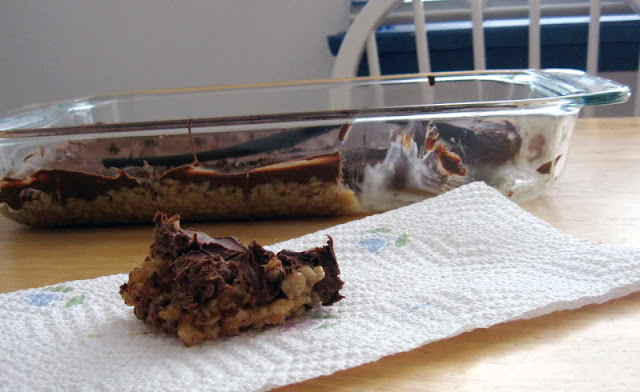 I still have a bunch of rice krispies, so maybe I'll try some other rice krispie variations!